This website’s main traffic for the last few years has been for content and tools related to Battrick – users following the links there to this site, or finding this site in search results for the term “battrick” and / or the name of the tools I’d built for it. The Thesis WordPress theme that I purchased is amazing, and probably the best, most comprehensive theme out there. The SEO, usability and customisation benefits are superb. My thoughts on the Thesis theme for WordPress and why I can’t *quite* bring myself to purchase it. Yet. I had an issue today where IE7 wasn’t applying opacity to images, even with the filter:alpha(opacity) hack (as CSS3 opacity isn’t supported). Here how to fix the problem. Look what arrived in the post for me yesterday! 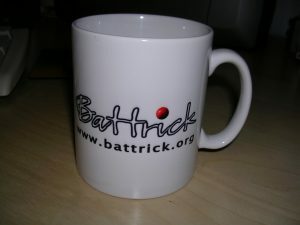 My very own, named, mug with the Battrick logo printed on it! We’d got a report that a page on the Battrick site was coming up as being a phishing url in Norton Internet Security. I tried contacting a Norton agent, to see if they could help, as although the page in question is in a “hidden” frame, it’s not even close to being a phishing page. This is the chat log.